ICMAI Admit Card is issued by the Institute of Cost Accountants of India (ICMAI). The aspirants who submit their Application Form for the CS course before the last date with complete payment are issued the ICMAI Admit Card. The admit card can be downloaded from online mode only from the official website, icmai.in. From this page, the candidates can download their admit card for Certificate in Accounting Technicians (CAT), Foundation, Intermediate, and Final course. To download the CMA Admit Card, the applicants have to log in by entering their Registration Number. No hard copy of the ICMAI CMA Admit Card is sent to the candidates by post. 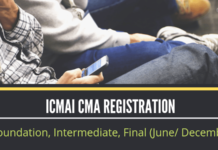 Check here complete details on ICMAI CMA 2019 Admit Card. The Admit Card is an important verification document which must be carried on the day of the test. Candidates should note that only the printed copy of the CMA Admit Card is allowed for entry inside the test center. Check the complete schedule for ICMAI CMA Admit Card from the table below. How to Download ICMAI Admit Card? The candidates can download their admit card for ICMAI exam for Foundation, Inter/ Final by following the instructions as given below. Next, the candidates need to select their respective course from the drop-down menu and then click on “Click Here” button. In the next screen, candidates will then have to log in by entering their Registration Number. Submit the registration number and then in the next screen, you can download your Admit Card. Finally, take a print out of it to bring the same on the day of the test. What Items to Carry to the Test Center? A valid Id proof such as Aadhaar Card, Driver’s License, Voter ID Card, etc. The Institute is conducting the CMA Foundation, Intermediate and Final course at the various test cities in India and at fee overseas test center. The candidates can check the complete list of test centers from the table below. The admit card for CMA Foundation, Intermediate or Final exam is a very important verification document. The candidates need to carry a printed of it on the day of the examination. It is advised to the candidates to keep at least 2-3 copies of the CMA Admit Card, in case if the original goes missing or gets damaged. The admit card for CMA exam consists of Roll Number which is to be used at the time of declaration of ICMAI CMA exam result. If you have any confusion about the ICWAI 2019 Admit Card, then let us know in the comment section below. It is mentioned above how to download admit card. Follow those steps and download. Roll number is not mentioned on my admit card. Is identity card mandatory for inter student also?